Do hummingbird feeders delay fall migration? If you live somewhere with hummingbirds over the summer, find out the right time to call it a season and bring in your feeders for the winter. This is part of series on these well-loved birds. Also see, The Hummingbird Quiz to test your hummer knowledge. 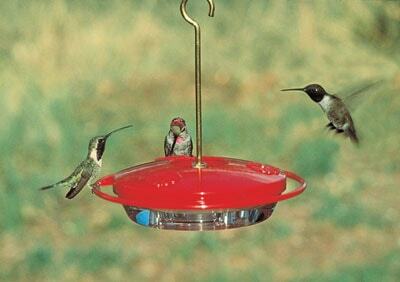 Do Feeders Interfere with Fall Hummingbird Migration? Where we live, we’re in part of North America that gets hummingbirds over the summer. Ruby throated hummingbirds, in our case. They start arriving in spring and we’re now at the time of year where they will be leaving us, migrating to warmer climates and staying there over the winter before returning next spring. I did see one in the garden today, but they won’t be around too much longer. With all migrating hummingbirds, a question that often comes up is when do I need to remove my hummingbird feeders from my garden? In fall, natural sources of food are becoming less abundant. Can hummingbird feeders disrupt their seasonal timing and delay migration to a point where it would be a perilous journey? Or, where they could be killed by a cold snap along the way? It’s not an unreasonable thought. Availability of food is a factor in the exact timing of hummingbird migration, but it is not one you have to worry about. The overriding factor in their timing is the shortening of the days and less intense sunlight we get once summer starts winding down. This has been coded into hummingbirds over millennia and it’s what they do every year, and as lovely as your garden and your feeders no doubt are, they aren’t going to override what’s in the hummingbirds’ genes. They will still migrate at the right time, with or without your feeders. So, you don’t have to worry about taking down your feeders before you ruin their migration. If anything, if you’re on a migration route, they may appreciate having some supplementary food sources available as they make their journey. But they will just refuel and move on. Related: Hummingbird Migration Map | Where are they now? This is the recommended recipe to use, providing the same sugar ratios found in the nectar hummers drink from flowers. Never use any other sweeteners or food coloring: just plain refined sugar and boiled water. Ants on Your Hummingbird Feeder? This simple homemade ant moat will stop them. Once you’ve gone a couple of weeks without seeing a hummingbird, then you can bring in your feeder for the winter, clean it thoroughly, and have it ready to go again in the spring. If you’re keeping your feeder up into colder temperatures, and you still have hummingbirds at that point, you will need to take some precautions to stop the nectar from freezing or glass dispensers from breaking, but it’s fine for the birds to have the feeders up. 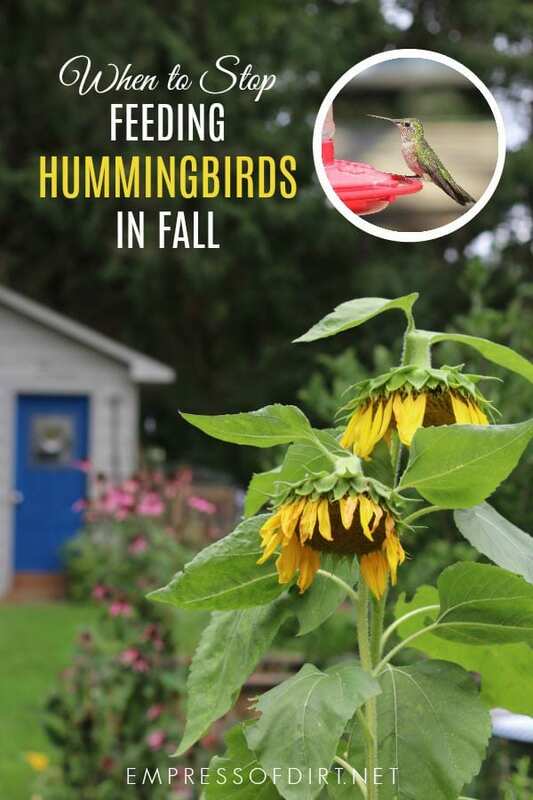 You never have to take them down, but you’ll probably want to once there are no hummingbirds around to use them. So, what about other species? Same idea. Migrating birds are wired to travel when the time is right. Providing appropriate food provides fuel for the journey, but, when it’s time to fly, it’s time to fly. Not necessary to boil water when making nectar, as long as clean water is used.